Mike McCarthy announced on Thursday that RB Cedric Benson had surgery on his injured foot Wednesday and would remain on injured reserve for the remainder of the season. When Benson initially injured the foot in Week 5 in Indianapolis, he was placed on IR with the designation to return. But that return now won’t happen. Benson said as recently as two weeks ago that he was going to be able to avoid surgery, but in the end, it was necessary. That leaves the Packers with three healthy running backs in James Starks, Alex Green and John Kuhn. Last week against the Giants, the aforementioned trio plus Randall Cobb combined for 40 rushing yards on 10 carries in the first half, a solid 4.0 average. 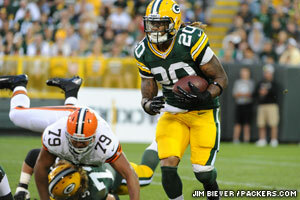 But trailing 31-10 at halftime, the Packers were forced to get away from the run. Against Arizona before the bye, Starks and Green combined for 114 yards on 28 carries (4.1 avg.). 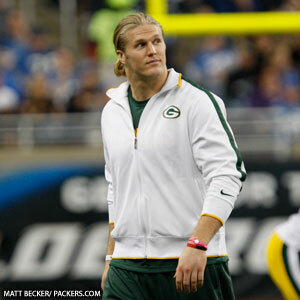 Packers LB Clay Matthews (hamstring) sat out practice once again on Wednesday, but Head Coach Mike McCarthy said he watched Matthews go through his rehab workout and the medical staff is planning to re-evaluate the star pass rusher on Friday. Matthews has missed the last two games due to a hamstring injury sustained against Arizona on Nov. 4. In other injury news, DE C.J. Wilson (knee) has all but been ruled out by McCarthy for this week, a tough blow for the run defense with Vikings RB Adrian Peterson coming to town. Fellow DE Ryan Pickett (quad) also missed practice, but McCarthy said Pickett should be back at practice either Thursday or Friday and the coach isn’t concerned about his availability for the game. LT Marshall Newhouse was added to the injury report with a wrist injury, and he was limited in practice, but as with Pickett, McCarthy didn’t express a high level of concern for Newhouse’s availability for the game. McCarthy also said that T Derek Sherrod was “not close enough” to being ready to play for the Packers to move him from the physically unable to perform list to the 53-man roster this week, so Sherrod will miss the entire season. As for RB Cedric Benson, he was going through an evaluation on his injured foot during McCarthy’s press conference and the results were not yet known. Benson has been on injured reserve/designated for return since hurting his foot in Week 5. He was eligible to return to practice last week but has not yet done so. Mike McCarthy announced on Wednesday that RB Cedric Benson has been placed on injured reserve with the designation to possibly return this season. That’s a new rule in 2012, and each team gets one such IR designation. Benson must sit out a minimum of six weeks of practice and eight weeks of games before he’s eligible to return. McCarthy said the Packers were targeting Benson to possibly return from his foot sprain for the final four weeks of the season, though that’s a premature projection. 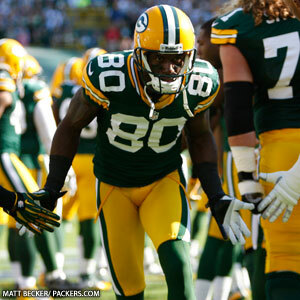 McCarthy also said regarding TE Jermichael Finley, DL B.J. Raji and WR Greg Jennings that all three would rehab their injuries this week, and the earliest any of them would return to practice would be Friday. 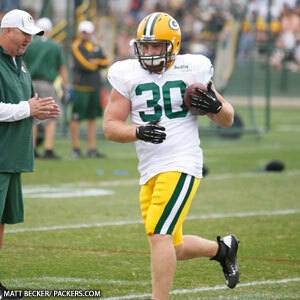 With all three players, McCarthy said he might take it all the way up until game time to see if they’re able to play. LB Desmond Bishop, who injured his hamstring in the preseason opener against San Diego and is out for the season, spoke to reporters on Tuesday and admitted it’s difficult to have to sit out the entire year. Bishop had surgery on the hamstring performed by team physician Dr. Pat McKenzie, and McKenzie told him it went well. There was talk before the roster was finalized of Bishop possibly going on injured reserve with the new designation to possibly return by season’s end, but Bishop said Dr. McKenzie didn’t think that was realistic. “I thought I possibly could have (come back), but whether or not it would have been smart to risk it is a whole different conversation,” Bishop said. He added that it was difficult to watch his teammates lose to San Francisco in Week 1, particularly with the defense struggling to stop the run. Niners RB Frank Gore rushed for 112 yards on just 16 carries. 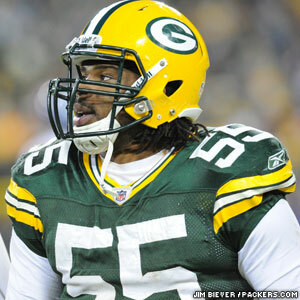 On Thursday night, RB Cedric Benson will be facing the team that drafted him No. 4 overall in 2005, the Chicago Bears. Back in 2009 while playing for Cincinnati, Benson rushed 37 times for 189 yards and a TD the first time he got a crack at his former team. The Bengals crushed the Bears that day, 45-10. Benson said he feels no extra motivation facing the Bears again this week, saying his years in Chicago were a long time ago and he holds no personal grudges. That’s especially true coming off his disappointing nine-carry, 18-yard Packers debut last Sunday. Benson was hoping to get more carries in that game, but he understood the game plan and the way the game unfolded didn’t call for that. For more of Tuesday’s coverage, click here. For all the talk surrounding new RB Cedric Benson’s preseason debut Thursday night, the game in Cincinnati will be another important step for RB Alex Green as well. Coming off of reconstructive knee surgery, Green has been on a snap count throughout training camp but has managed it well with no setbacks to speak of. He got three carries in the preseason opener in San Diego and then four in last week’s game vs. Cleveland, averaging 4 yards per tote in the second game. He had one 5-yard run that nearly ruptured into a longer gain, but Green was tripped up. With the status of James Starks (turf toe) uncertain at this point for the start of the regular season, the starting job for Sept. 9 could come down to Green or Benson. Green is getting closer to being able to handle a larger load, according to his position coach, Alex Van Pelt, and he looks to continue making progress. GM Ted Thompson said Tuesday morning that the 53-man roster for Week 1 is a long way from being decided with three preseason games still remaining. The Packers won’t make any cuts until after the third game, when the roster is reduced from 90 to 75 players. It comes down to 53 after the fourth preseason game. Thompson also dismissed the notion that the signings of 31-year-old Reggie Wells on the offensive line and 29-year-old Cedric Benson, a running back with a checkered past, have signaled any shift in philosophy with how he goes about building a team. He emphasized that those signings were out of necessity due to injuries and questions about depth at those positions. Particularly at running back, the injuries have piled up. When John Kuhn sustained an ankle injury Monday, the Packers were down to two healthy tailbacks (Alex Green, who’s on a snap count, and rookie Marc Tyler) and one fullback (undrafted rookie Nic Cooper). As for Benson’s off-the-field incidents over the years, Thompson said he spoke with Benson about them and came away confident that Benson is more mature now.